CAT is the common admission test 2017 it is completely based on the computer knowledge this examination is particularly held in India. This test score is based on the candidate's performance in the quantitative aptitude (QA), verbal ability (VA), reading comprehension (RC), logical reasoning (LR) and the data interpretation (DI). This examination is first introduced by the Indian Institutes of Management IIMs and later this CAT score can be considered by the Indian Institute of Technology IITs and also for Joint Management Entrance Test (JMET). As mentioned in the above paragraph the syllabus includes all the five sections and because of the time limit and some candidates may find it difficult to crack these sections. 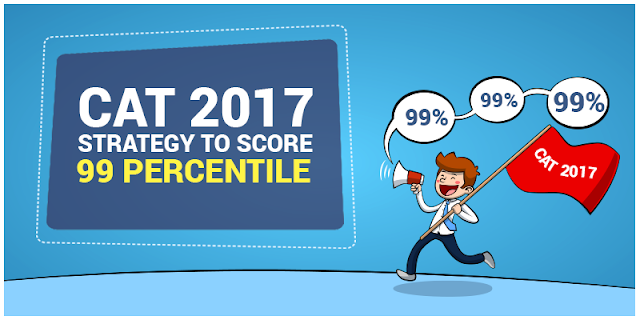 But the aspirants who are preparing for the CAT examination, most of the candidates can qualify in this examination but only very few people can get the 99 percentile and if you are one among them then you are on the right page. 1. Take coaching and as well as do the self-study: Take the coaching from the best coaching center and then do the self-study also. Because cracking the CAT exam without proper preparation is almost impossible and most of the candidates have cracked the bank examination without the coaching also but the only difference is the dedication and the hard work and the self-study. These three play an important role in cracking the bank examination. 2. The CAT exam is not tough: Never take the negative things into the mind because cracking the bank examination is not that tough but if you start thinking that the examination is tough and is difficult to crack then this will be a big blunder. You cannot go ahead with this thinking. So first make yourself sure that you can crack the examination and then start preparing for the examination at this stage only you can see the speed of solving the questions and the accuracy in you. 3. Give equal value to all the sections: In order to get the 99 percentile in the CAT examination you have to give equal importance to all the sections this is important because if you are scoring 90 percentage marks in one section and in the another section such as the data interpretation you are scoring 60 percentage marks then this will create a problem for you in scoring the 99 percentile in the CAT examination so just concentrate on each and every section. Many students specially from North India finds it difficult to score in verbal section. if you also face difficulty in verbal then pay special attention to verbal part. You can also refer Strategy to Prepare and Master the Verbal Section. 4. Take mock tests: Based on the CAT mock test result only your performance in the CAT examination can be assumed because these mock tests give the accurate result of the level of speed of solving the questions and the accuracy. And your only duty is to analyze yourself and then start finding your weak areas and then start working on it. In this way, you can analyze your preparation and where you are lagging. 5. Find tricks to solve questions easily: Even though they are providing the calculators in the CAT Exam candidates should not depend on the calculators for each and every question and the calculation part they should learn some shortcut tricks in order improve the speed of solving the questions in many coaching centers they will teach you the important and easy shortcut tricks. So in order to get proper time management and the accuracy these tricks are more important. Finally, follow the above strategies properly in order to get 99 percentile score in the CAT examination. The tricks and the speed of solving the questions in the examination can be obtained just by practicing the more number of question papers and also solving the different models of questions in the important topics.